Yother, Yothers, Yotter)|Yoder]], Zook, Byler, Hooley, Hartzler. Peachey (Bitsche), Renno, and Kauffman. The first Amish minister was probably "Long" Christian Zook, the first bishop Hans Beiler. In 1850 there were three Amish church districts with a membership of 290. In 1900 the total membership in Mifflin County was 863: Belleville 155 and Allensville 110 in the Eastern A.M. Conference; Peachey (3 districts) 250, Old School (2 districts) 159, Locust Grove 110, and Mattawana 79 across the mountain and in the Eastern A.M. Conference. 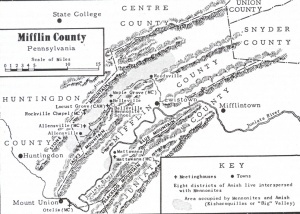 The Mennonites in Mifflin County in the 1950s all stemmed from the early Amish settlers. The settlement gradually gained in membership in its 200 years of history, even though at various times some of its families moved westward to Ohio, Indiana, Iowa, Missouri, Nebraska, and North Dakota. Since 1849 there have been various schisms in the Amish group so that there were eight differing Amish and Mennonite branches or conferences in the county in 1956, totaling 1,796 members. Farming was then the chief occupation, with special emphasis on dairying. The three villages in the heart of the settlement in Kishacoquillas Valley are Allensville, Belleville, and Reedsville. Hartzler, J. K. "Fifty Years with the Amish Mennonite Churches of Pennsylvania." Herald of Truth (1 June 1902). Hostetler, John. A. "Life and Times of Samuel Yoder." Mennonite Quarterly Review 22 (October 1948). Hostetler, John A. "The Amish Family." MA thesis, Penn State, 1951. Peachey, S. W. Amish of Kishacoquillas Valley, Mifflin Co., PA. Scottdale, 1930. Yoder, J. W. Rosanna of the Amish. Huntingdon, 1940. Yoder, J. W. Rosanna's Boys. Huntingdon, 1948. The Yoder books portray Amish life and customs of the Mifflin County area. Hostetler, John A. "Mifflin County (Pennsylvania, USA)." Global Anabaptist Mennonite Encyclopedia Online. 1957. Web. 18 Apr 2019. http://gameo.org/index.php?title=Mifflin_County_(Pennsylvania,_USA)&oldid=143667. Hostetler, John A. (1957). Mifflin County (Pennsylvania, USA). Global Anabaptist Mennonite Encyclopedia Online. Retrieved 18 April 2019, from http://gameo.org/index.php?title=Mifflin_County_(Pennsylvania,_USA)&oldid=143667. Adapted by permission of Herald Press, Harrisonburg, Virginia, from Mennonite Encyclopedia, Vol. 3, pp. 683-684. All rights reserved. This page was last modified on 15 January 2017, at 23:08.